Lately I’ve been experiencing some similar conversations … chats with my students, mentees and interested bystanders about how to persuade authority figures who are skeptical about the visual way of working. And I figured it warranted an article. I thankfully never had this issue when I entered this work going on two decades ago. I stumbled upon ‘group graphics’ while in grad school in San Francisco in the mid-90s via The Grove Consultants International (pioneering visual firm headed by my early mentor, David Sibbet). Right from the get-go, thanks to David and The Grove’s professional example, I always viewed the visual way of working as being progressive, professional and highly effective. Leading-edge. Something that Silicon Valley companies (and other Fortune 100 organizations from across North America and Europe) were using to help them successfully conduct strategic thinking meetings and processes. It never crossed my mind to think that working visually was ‘stupid’, ‘silly’, ‘juvenile’, ‘unproven’ or the myriad of things that some current students and explorers seem to be concerned about. I think this negative or skeptical phenomenon is more a symptom of the visual work “trickling down” so to speak … going more mainsteam into organizations and leaders that are later on the adoption curve (i.e. 30-20 years later … but hey, who’s counting LOL!). As the visual way of working becomes more and more known and dissipated (and it is) … then industries, companies, schools, leaders, and managers who have never heard of it, let alone experienced it, are being requested by their employees, clients and vendors to use it (or let them be trained in it). So this is where the tension is occurring. Fair enough. If you are in this situation (being in an environment or atmosphere where you want to work visually but are experiencing resistance, skepticism or downright hostility) … well, these answers are for you! To help you hopefully combat the negativity in a successful manner. Or, to give you ideas about where to go where your innovative instincts are more acceptable! One thing I have learned about this visual way of working … is that it is experiential. Try as I may to write about it (and I have) it’s really something that you need to EXPERIENCE in order to ‘get’. And, ideally, experience it in an EFFECTIVE application. Unfortunately, as more folks enter the field without proper training, they are winging it … and confusing the marketplace in the process. However, those who do have proper training and are set up well to apply the four main ways of working visually, are doing good work and turning more and more people onto this effective way of working. Good work begets more work (and more organizations willing to try it). Also, another thing that you can throw out to skeptical people are the amount of companies (1000s) who have used this over time (going on over 35 years now). Here’s a partial client list from my own practice since I moved back to Canada and I’m now just one of hundreds of people doing this work full-time (let alone the tens of thousands doing it part-time or within their regular jobs). 2. IT’S ABOUT ‘THE PROCESS’ SILLY! The last few years have seen the entry of highly skilled artists and illustrators into the field. While this is not a bad thing in and of itself, if those folks do not have proper process understanding, they have a way of skewing the work to be viewed as illustrative in nature as opposed to being a true process aid, i.e. just a bunch of “pretty pictures”. Given the live nature of true interactive-visuals work … there shouldn’t be time to do beautiful illustrative work if the practitioner is truly focused on capturing content accurately. Content should always come first. And the visuals should always be in support of the client’s content (not on what the particular practitioner can or likes to draw). Unfortunately a lot of what passes for Visual Recording these days is more of a “party trick” … big on ‘wow factor’ but low on true substance. If you are trying to persuade skeptics, stick to functional Visual Facilitation or Visual Coaching work that truly serves a process (i.e. strategic planning, team building, conflict resolution, etc). Organizational leaders want and need tools that truly help people effectively think together and make informed decisions. Not a bunch of pretty but relatively ineffective doodles. Don’t get me wrong, doodling is awesome. But the doodles need to be connected into good content and process in order for them to be effective. Tip: For an easy entry into truly effective Visual Facilitation for organizations, I highly recommend the template -based work of The Grove Consultants and Idea Connect. 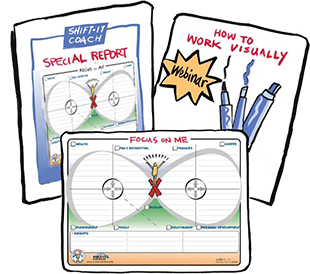 For coaching work with individuals, I recommend my SHIFT-IT Tools via Visual Coach Certification. If it’s any consolation, and for some it is … academic interest in the visual way of working is growing … rapidly. Not only are professors interested in the visual way of working for more effective learning in their classrooms they are also interested in Interactive-Visuals as a research area. As one academic who recently took my Fundamentals of Interactive-Visuals program told me, “there are few open frontiers left for researchers to explore — visual ways of working is one and finding a fresh new area of research is highly coveted”. I guess that explains the recent spat of invites I’ve received from conferences, think tanks and academic huddles (to take non compensatory time out of my busy schedule to come ‘prove’ my work to them). While I could totally digress on the hubris of the more negative folks who approach me (and their attempted ownership and usurping of a method that has been around for generations) its does bode well for you that this is happening. It means that the academics will ‘scientifically prove’ what us early adopter visual entrepreneurs have known all along … that people think and make decisions more effectively when proper visual techniques are used. And pretty soon you will have scientific papers to direct your skeptical bosses to. (2010). The evaluation of argument mapping as a learning tool: Comparing the effects of map reading versus text reading on comprehension and recall of arguments. Thinking Skills and Creativity, 5, pages 16–22. And I am in the process of getting a paper published about a mixed methods evaluation of graphic recording as a tool to augment climate change communication. Let me know if you’re interested and I can send you the paper that’s currently under review! Unfortunately I cannot find contact information for Christina in my copy of her report, nor can I find the relevant email. 1. Do you believe that language gets in the way when visual tools are being used or can words be used effectively in combination with visuals? No, it doesn’t get in the way, it actively helps. There is research on this. The foremost researcher I know of who is looking into this extensively is Richard E Mayer. 2. What resources–academic or otherwise–would you recommend for further research in this field? All of these report practical, applicable principles drawn from Mayer’s and others’ research, with references. I propose them because I believe that meetings, problem-solving, decision-making, and all forms of group human endeavor involve first and foremost learning – from each other, from experience, and from whatever sources the group can draw on. Not “teaching”, but true learning. I give the stats from Roche Pharmaceutical study that polled employees before and after a vision visual here in this talk: TEDxRainier – Draw Your Future http://www.youtube.com/watch?v=zESeeaFDVSw. John Medina also talks about it in his book – that you are 65% more likely to recall information if you see it and draw it at the same time you are learning it. A number of educational studies show this as well – do an online search for that data. Hopefully with the resources I have shared with you, you’ve found some good material to persuade your skeptics about the value and acceptability of working visually. As a pioneering Visual Coach, I help individuals SHIFT their work and life … and a good majority of my clients are professionals who are using visual methods to some extent or other in their livelihood. If you need some private help in strategizing how to expand your visual practice (including persuading skeptical colleagues, authorities or clients) consider some tailored private mentoring to help you get what you want. I also facilitate my Magic Marker Mastermind that collects Visual Practitioners together to receive instruction and support. A professional way to make the visual way of working a reality … and make valuable visual alliances too! Hi Dana. Thanks for the comment. While you know that I don’t like to focus on the negative … I have been writing in my last several articles about this very phenonmenon. Some artistic folks who aren’t process sauve are getting into the game and confusing/cluttering the marketplace. And, unfortunately, some of what I (and you) would define as Graphic or Visual Recorders … are erroneously naming themselves Graphic or Visual Facilitators. I try the best I can in my articles and workshops to educate up and comers about the correct nomenclature. 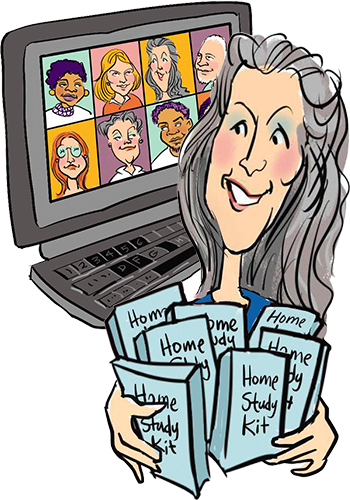 I’d direct people who are interested to my earlier articles entitled ‘The Four Ways of Working Visually’, ‘How to Hire a Visual Practitioner’ and ‘How to Build a Visual Practitioner Career or Hobby’. The good news is that the field is growing. The challenging news (for folks like the two of us who have been in this work for decades) is that there is a lot of misinformation and lack of understanding. Most of it is not malicious, its just lack of knowledge and experience. I’m sure it’ll ‘work out in the wash’ so to speak in the next chapter of this field. I’m sure doing my best to assist with the awareness, as I know you are too. Thanks for commenting! This “how to handle visual skeptics” is spot on. You’ve pointed us to the emerging academic research, you’ve stressed how important it is to be grounded in traditional process-based facilitation, and have stressed how important it is to stress that such organizational learning is experiential. What I find encouraging is that we now see training tracks at conferences such as the International Association of Facilitators and extended seminars offered in regional groups such as the Mid-Atlantic Facilitators Network.